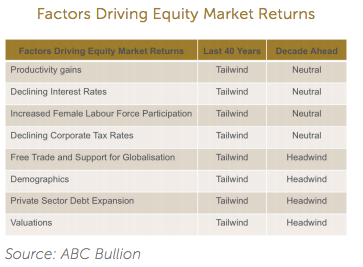 Over the last 40 years, investors have enjoyed a golden era, able to generate returns of close to 7.50% p.a. in investment grade credit, and over 10% p.a. in equities, with this historical outperformance driven by a handful of factors including rising debt, huge increases in female labour force participation, and the halving of corporate tax rates across the OECD. At last weeks SMSF Association National Conference in Melbourne, we presented a research note looking back at this 40 year period, and why the era of “Easy Money” for global financial markets is now over. We paid particular attention to Australia, Australian investment portfolios, and our residential property market, looking at the symbiotic relationship between capital city home vales, the share prices and dividend payouts from our major banks, and the concomitant change to their underlying business models. 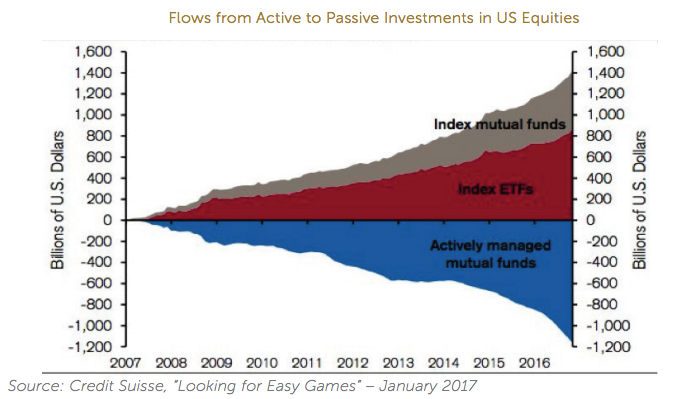 We also provided nine key takeaways for self directed investors and advisers, including a cautionary note on the rush toward passive investments, and why volatility may be the least of the risk factors one needs to allow for in the coming years.